JBL has been trying to get into the market of portable wireless speakers with several different types of products. These products include ones like the Micro Wireless and the Flip Wireless Speaker. The JBL Flip gets its name from its unique design to either be set horizontally or vertically in a small package while packing enormous, clear sound. The design of the JBL Flip is a cylindrical speaker that has the ability to either lay down horizontally or stand up vertically. I felt that listening to the speaker in the horizontal orientation allowed for a more full surround sound style of listening by having your main speakers on the left and right instead of being stacked. When the speaker is horizontal you will notice that on the top there are three buttons. From the front to the back, you have the Power/Bluetooth connectivity button, volume rocker, and end call button. Using the Bluetooth capability of the speaker allows you to project the sound from your phone when you are in a voice call, hear the person you are talking to loudly and clearly, and respond using the speaker with its built in microphone. I find it disappointing that the speaker isn’t recharged using a simple micro USB to male USB cord so you are virtually able to charge anywhere instead of having to carry around a bulky AC adapter when you go on trips. 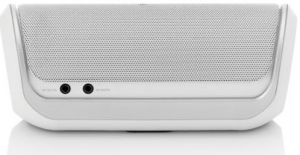 Another downfall I found about the speaker is that since it is small, you are only able to really get a true stereo surround sound when being about 2 to 4 feet away from the speaker. Don’t get me wrong, this speaker still packs a powerful punch when listening to it in a small room with all of your friends. The JBL Flip is a convenient accessory that will stay equipped with power for almost five hours to a charge. I love using this speaker for easy connectivity and portability when I want to hear a song without having to use my low grade built in speaker in my MacBook Pro. 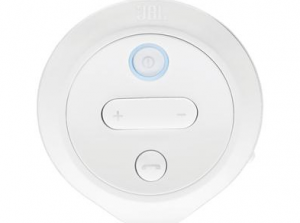 The JBL Flip is set at a price to where almost anyone can afford quality sound when listening to music without having to spend hundreds of dollars on a huge non-portable sound system. 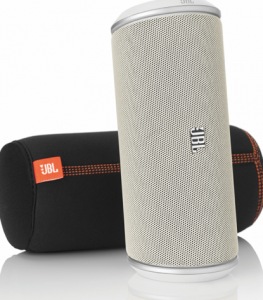 I feel that the JBL Flip gives you a taste of what large sound systems offer at a affordable price. My MyMac rating for this product is 8 out of 10.